Reproduced cover image of On the Camera Arts and Consecutive Matters: The Writings of Hollis Frampton, edited by Bruce Jenkins, 2009, MIT Press. Several events in New York tonight call for some attention. First, in Chelsea, X hosts a public discussion between art historians Hal Foster and David Joselit as they discuss "recessional aesthetics" and whether the recently reconfigured public relationship with the material -- evinced most explicitly in the past few days by the populist furor over the 2009 AIG bonuses in this country and symbolic but grave actions across the European continent -- will necessarily compel a change in the public relationship with the cultural. The New School, meanwhile, hosts a panel on girlhood, with a distinguished all-female group of speakers attending, including musician Kathleen Hannah, writer McKenzie Wark and several others. Anthropologist Michael Taussig will speak at NYU on a yet unpublicized topic. Further west, Renwick Gallery presents with the second night of its first invitational performance series, featuring Alexandre Singh, Tyler Coburn and others. 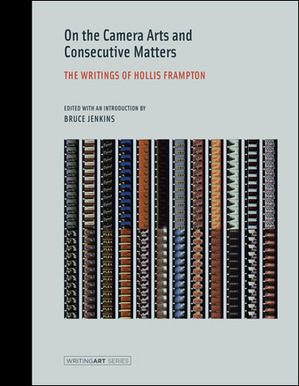 And finally, Anthology Film Archives continues their second day of Hollis Frampton's Hapax Legomena series, coinciding with the recent publication of the intensely ambitious filmmaker's collected writings. It's also worthy of note that Anthology has arranged a group of remarkable guests to introduce the individual film programs of the cycle, including Keith Sanborn, Annette Michelson, P. Adams Sitney, Bill Brand, Bruce Jenkins and Gerry O'Grady.